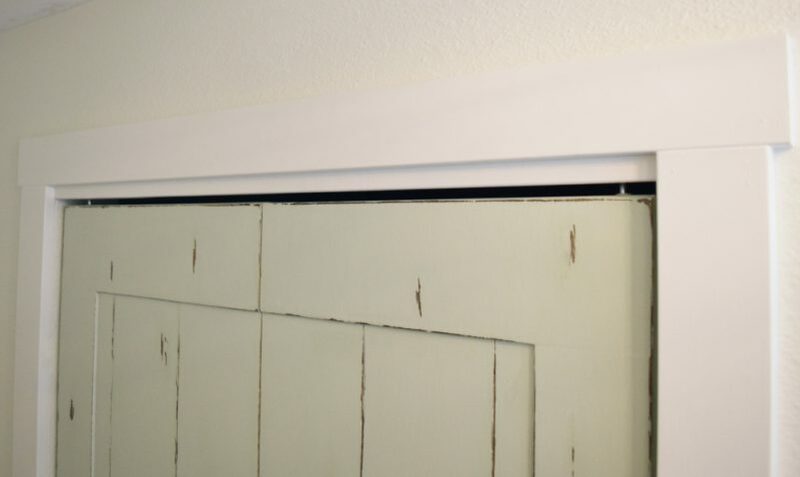 If you are like me and just can’t get enough of shiplap here is a way to add that farmhouse feel that is different than the traditional way of nailing it to your walls. 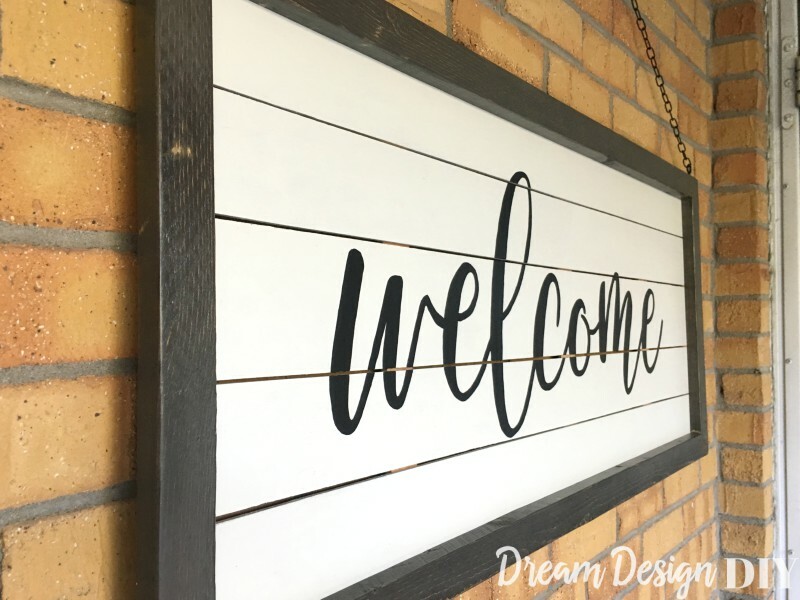 In this post I will show you how to create a Large shiplap Welcome Sign. I was able to complete this project from left over plywood from my Kitchen Nook Shiplap Bay Window. 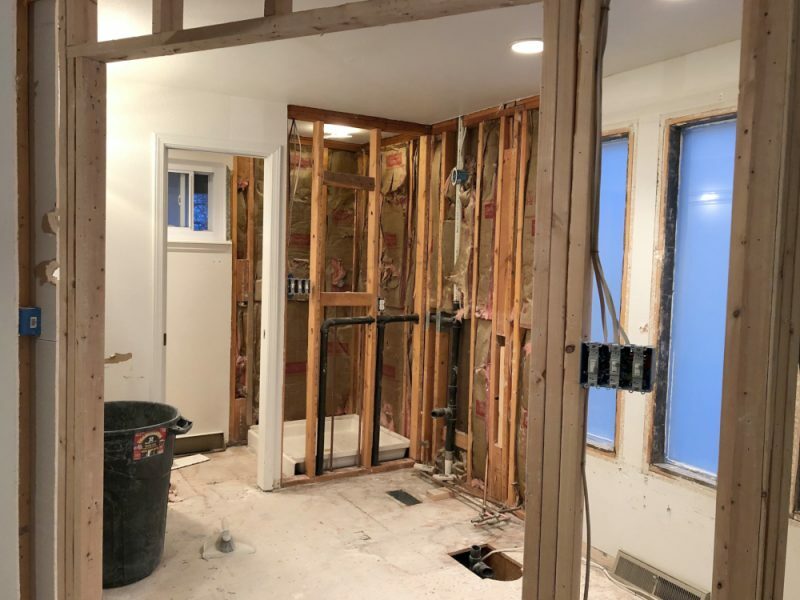 *Before you get started make sure you have your Safety Gear. 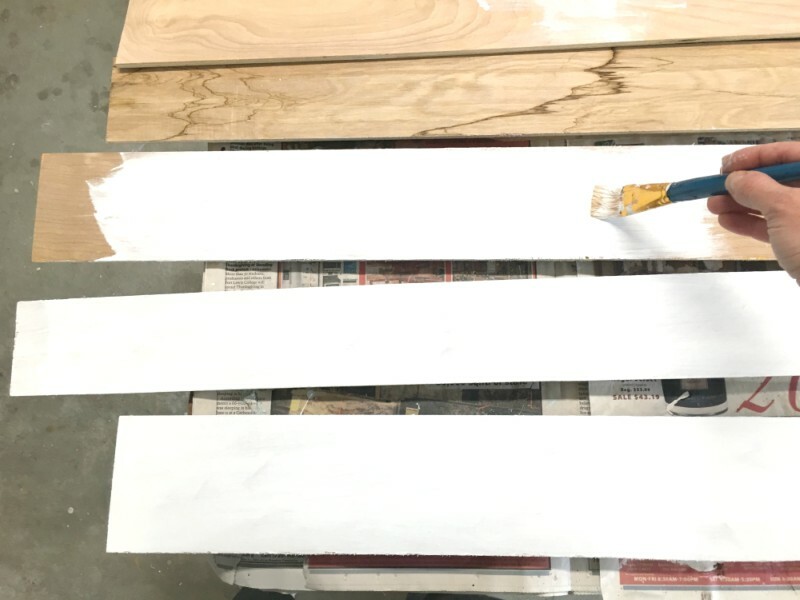 For this project I recommend safety goggles, ear protection, a P100 – Mask for staining and optional N95 mask to prevent breathing wood particles during sawing and sanding. My completed sign measured 41 1/4 x 17 3/4 inches. 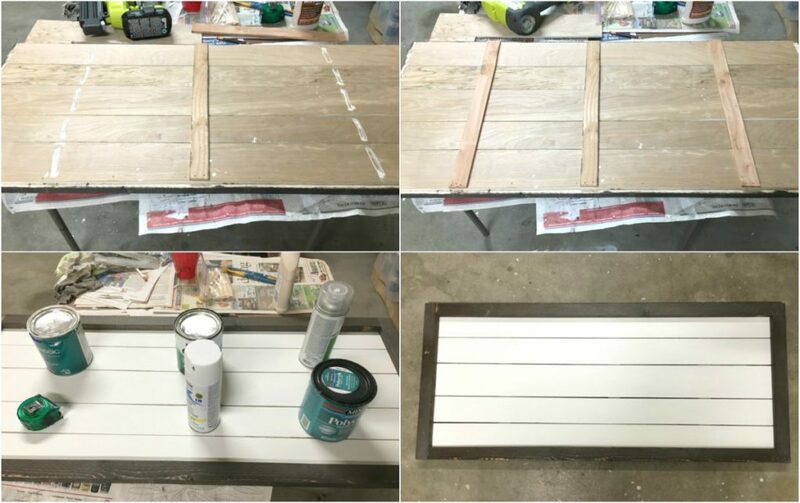 Step 1) After my cuts were made for the plywood I laid out the pieces and applied two coats of a flat white latex paint. While this was drying I started on constructing the frame. Step 2) To construct the frame I applied wood glue to the end of the long pieces (top and bottom) and then nailed the sides to the ends of the top and bottom pieces. Make sure to use a square to help with making and keeping a 90 degree angle. Then I filled the holes with wood filler, sanded and stained the frame. I applied Minwax in Espresso and then added a second layer of Rust-oleum in Weathered Gray. 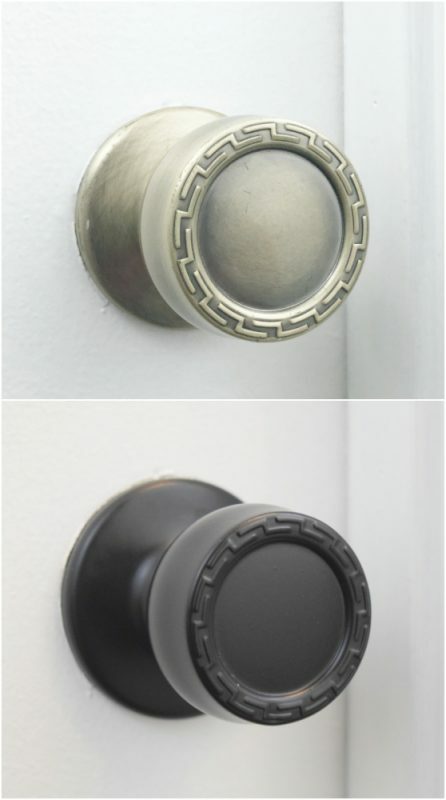 This creates a brownish gray finish. Step 3) Once the stain dries it is time to attach the wood planks. To do this I laid the frame on the ground and laid several pieces of scrap wood inside the frame. 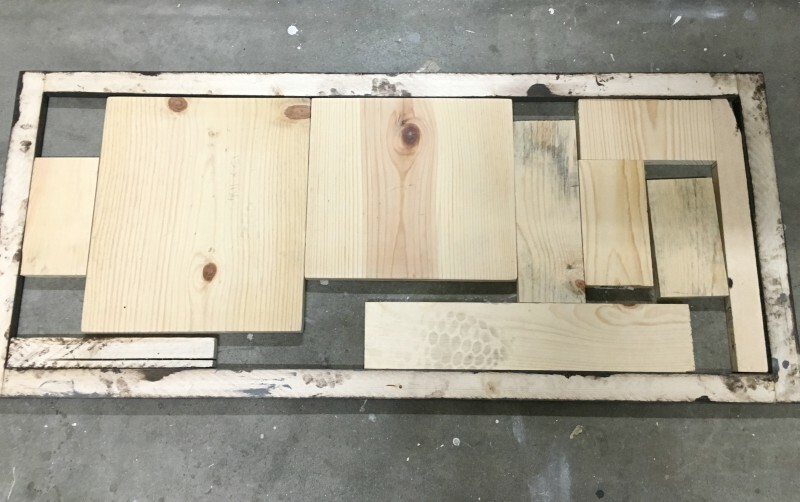 These scrap wood pieces were a way to support the wood planks from bending in while I nailed them to the back of the frame and also to keep the popsicle sticks in place. Using a carpenter square I laid the wood planks paint side down on the back of the frame using popsicle sticks to create a gap between the planks. Once I had the wood planks how I wanted them I nailed them in place with 5/8 inch 18G brad nails. As extra support I glued and nailed three wood shims to the back of the sign. Then I flipped the whole piece over and placed some heavy items on the front for the glue to adhere. 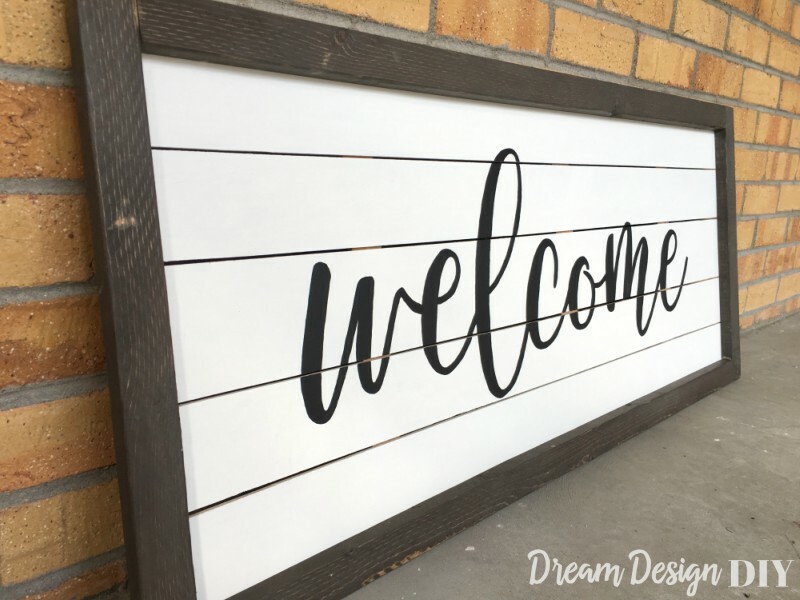 Step 4) While the glue dried I created the “welcome” image. I used Sarinah Scrip, font size 668 and created it in Block Posters. 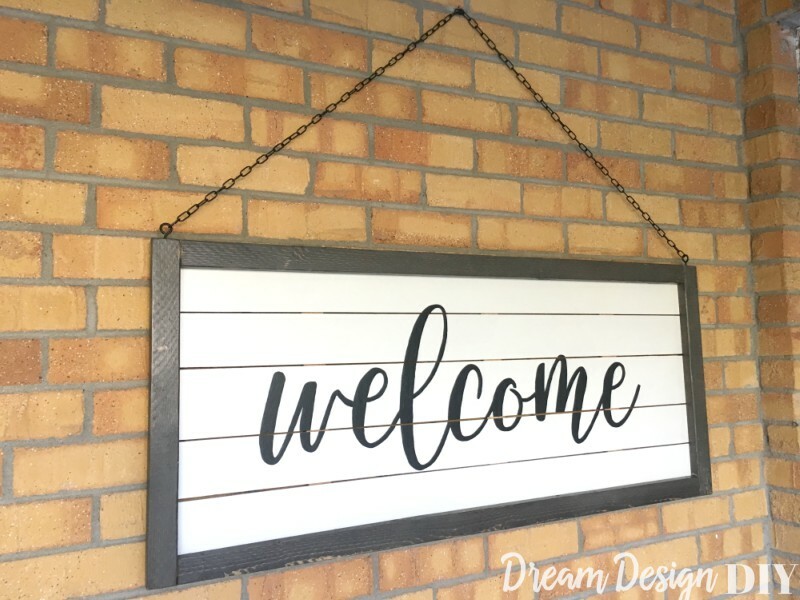 Here is my Welcome Text Image if you would like to use it for yourself or click below to be directed to the PDF. To transfer the image I placed Carbon paper under the paper and outlined the text with a pencil. The carbon paper does an awesome job at transferring the image to the wood. 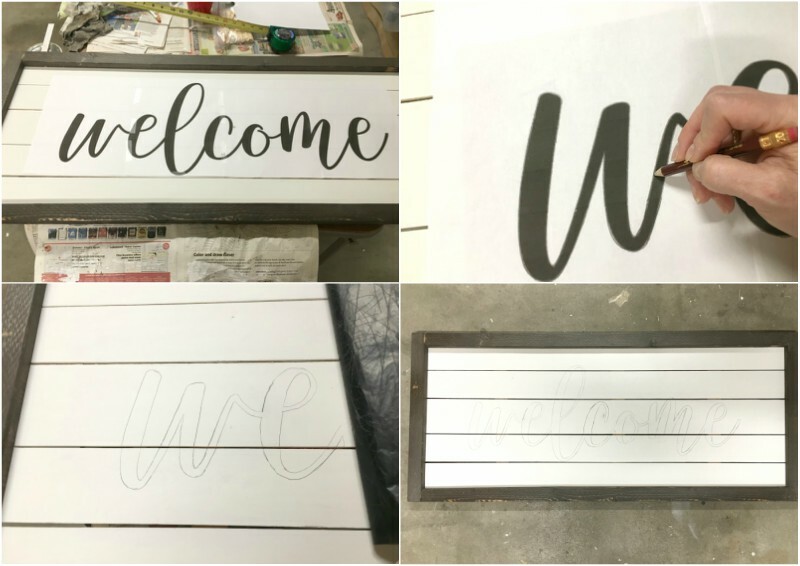 I used this same technique for my Large Pallet Sign. After transferring the image I painted the letters with flat black latex paint. I also added several coats of an exterior Spar urethane spray to protect it from the outside elements. 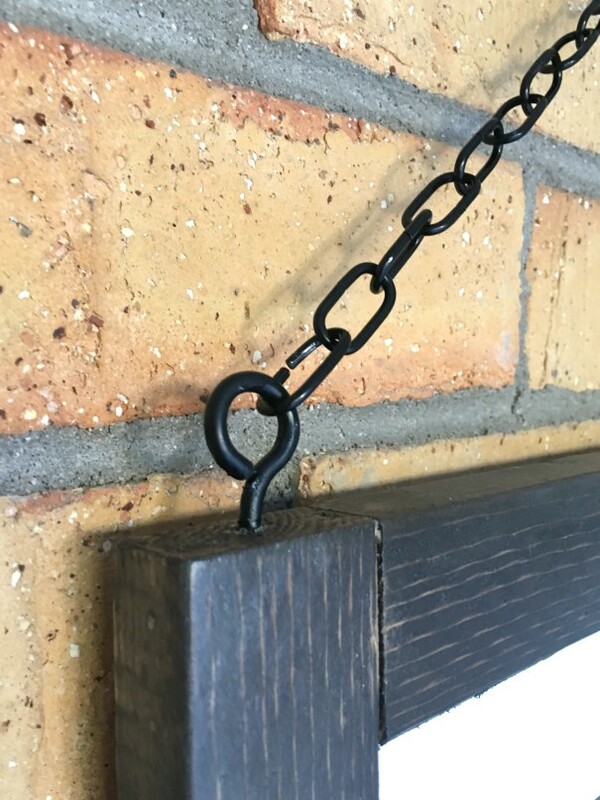 Step 5) For my hanging hardware I used black spray paint to paint two screw eyes and attached them to each end at the top of the frame and threaded a black decorative chain through the screw eyes. Finally I hung it up in my front porch. 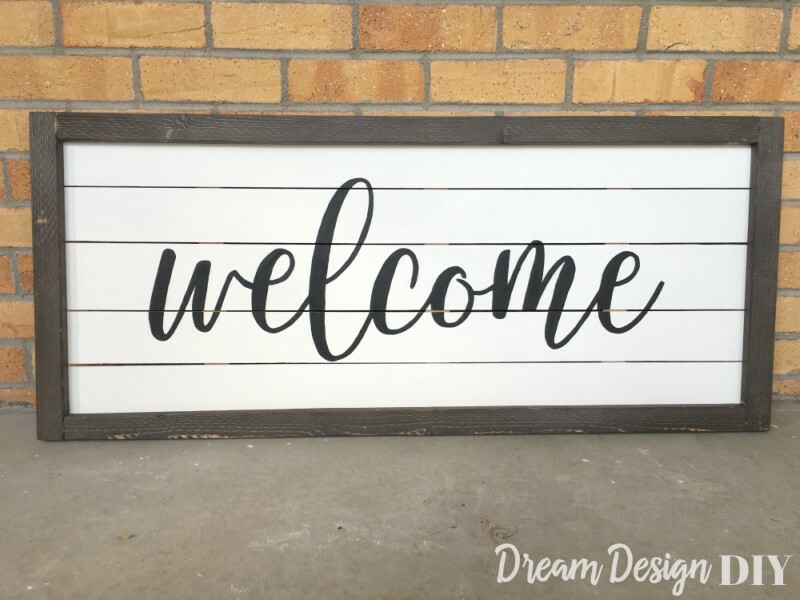 I am in love with this sign and I think its a great way to welcome guests over to our home. 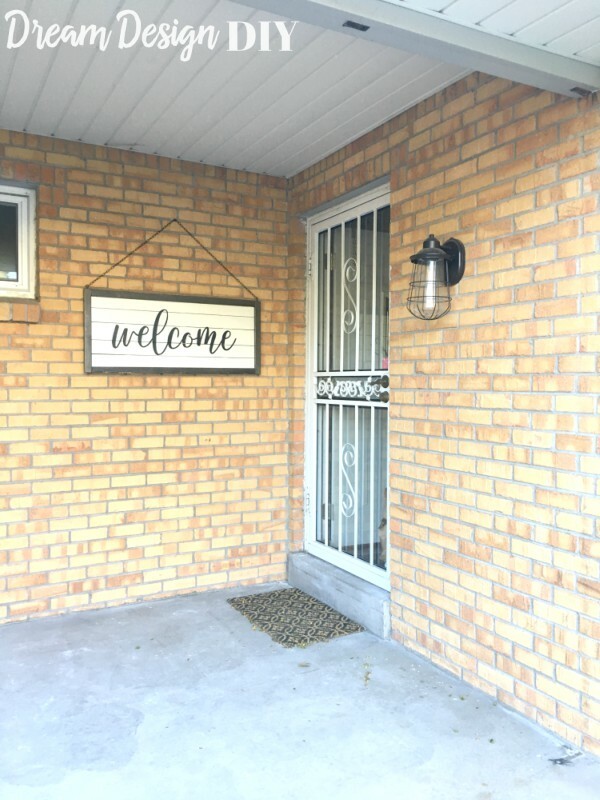 This is one of the first projects to spruce up my front porch. 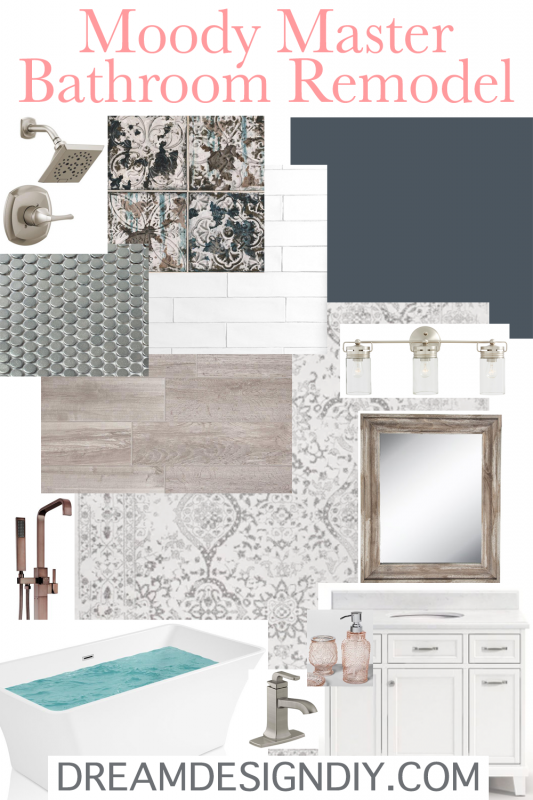 Stay tuned for more projects. This is so cute! 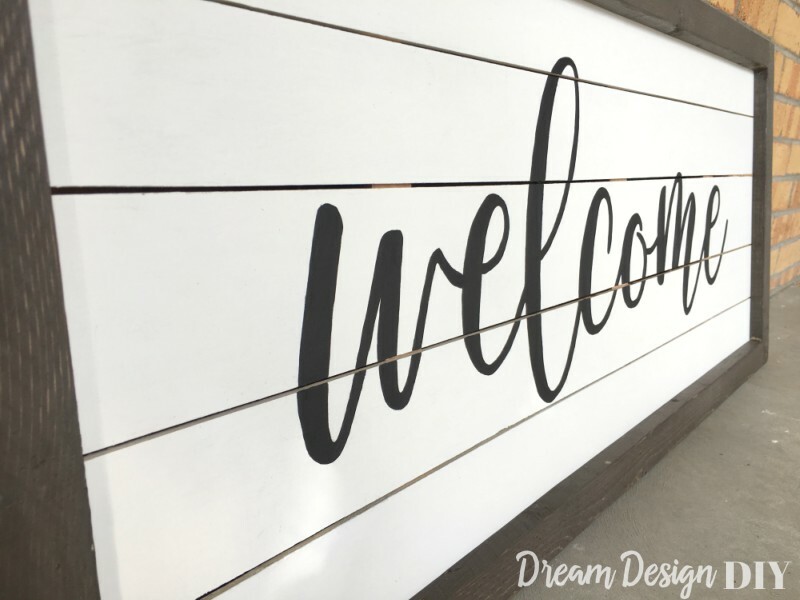 I have always wanted to find an affordable way to transfer letters and sayings onto a sign! Thanks for the tips! Thanks for your sweet comment! Yes I love this way to transfer images, especially with larger letters it is pretty easy and no fancy machine required.